Welcome to this beautiful country villa, situated in a charming village, Lloret. It accommodates 10 people. Wonderful stone house in Lloret de Vistalegre with salted pool and tennis court, ideal for 6 - 7 guests in search of a nice vacation in the countryside. Beautiful 2-story property located in the countryside of Lloret de Vistalegre. It offers views of the countryside and it can comfortably accommodate 6 people. Stylish country house in Ruberts, in the centre of Majorca, with private pool, garden and capacity for 6 people. Fantastic rustic but also modern villa with private pool, located within the town of Sineu. It can comfortably accommodate from 4 to 8 people. This charming country house for 6 guests with a private pool is located in Sineu. 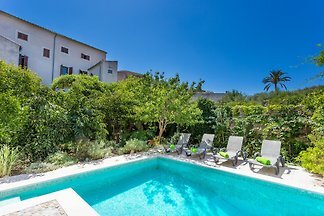 Village house in Sineu, in the centre of Majorca, with beautiful fields views and capacity for 4 - 6 guests. Welcome to this beautiful huge house in Sineu. It can accommodate up to 8 people. Rent successfully your holiday flat or holiday home in Lloret de Vistalegre in only 20 minutes !